The earthquake and tsunami has affected many lives in Fukushima. 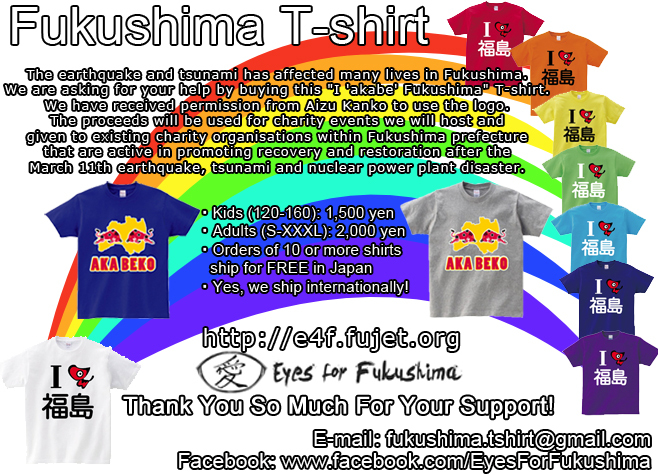 We are asking for your help by buying this "I 'akabe' Fukushima" T-shirt. We have received permission from Aizu Kanko to use the logo. The T-shirts will be 2000 yen each. The proceeds will be donated to the Great East Japan Earthquake Fukushima Children Charity project through Fukushima Prefecture Disaster Countermeasures Office(東日本大震災ふくしまこども寄附金). Children sizes (120-160) are 1,500 yen. Adult sizes (S-XXXL) are 2,000 yen. Furikomi Details through any ATM. Please send the money after I confirm order details. Please direct international orders to Galileo Yuseco - fukushima.tshirt@gmail.com.